Here are my* personal observations of some of the things that went on at Synod. These are not official minutes, and can not be guaranteed for their accuracy. I have concentrated on the things that struck me as interesting or important, and I will have omitted reporting on some issues which you may have picked up. Would you like to have a go at reporting the events at Synod for the website? Would you like to take the photographs? Then please let the Synod Clerk know! This was a little inconvenient for the business part of Synod which was packed into the morning as many folk had their backs to the stage - perhaps this was part of the reason we got through the business a little early! It worked better for the afternoon for the presentation of the Synod review group and the discussion - in groups - about a Charter for the Synod led by our young people and the URC's General Secretary John Proctor. Synod began with a Presentation of Certificates. The first to Revd Paul Fuller marking 50 years of ordination. The second to Mr David Litchfield who has successfully completed the two year TLS foundation course. It may be called a 'View from 2025' but the plain fact is that the number of stipendiary ministers within the URC is falling now, and is set to fall even faster over the next few years. So we have to start planning now. Already across the Synod there are pastorates without a minister and with no hope of calling one. There are worries that this is the end of the United Reformed Church. Peter reassured us that the decline in the number of ministers is not a sign that God has done with us. It is a sign that things must change. In 2025 it looks like we will have no more than 18 stipendiary ministers to serve the Synod of over 110 churches. 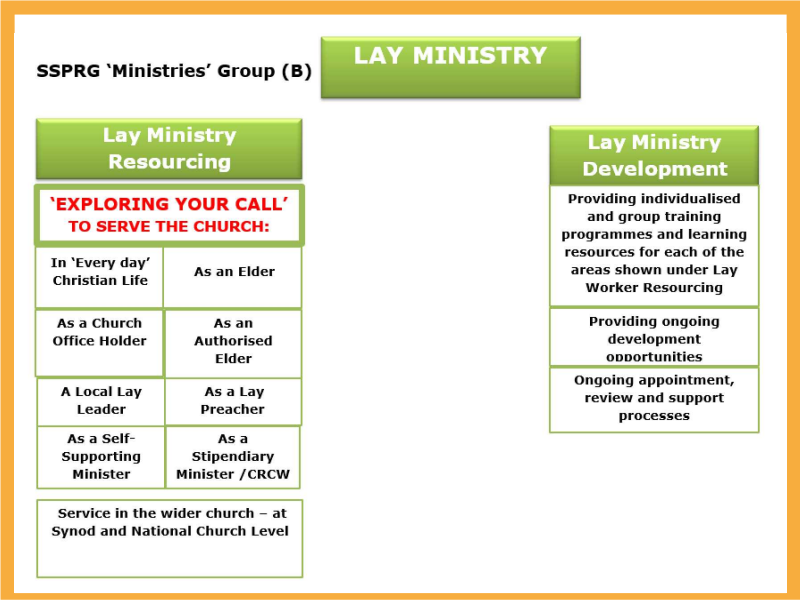 Clearly the way that ministers work will have to change, as will the expectations that churches have of ministers. Ministers will become much more leaders, managers and inspirers of teams who will do on the ground what ministers used to do themselves when we had lots of them. 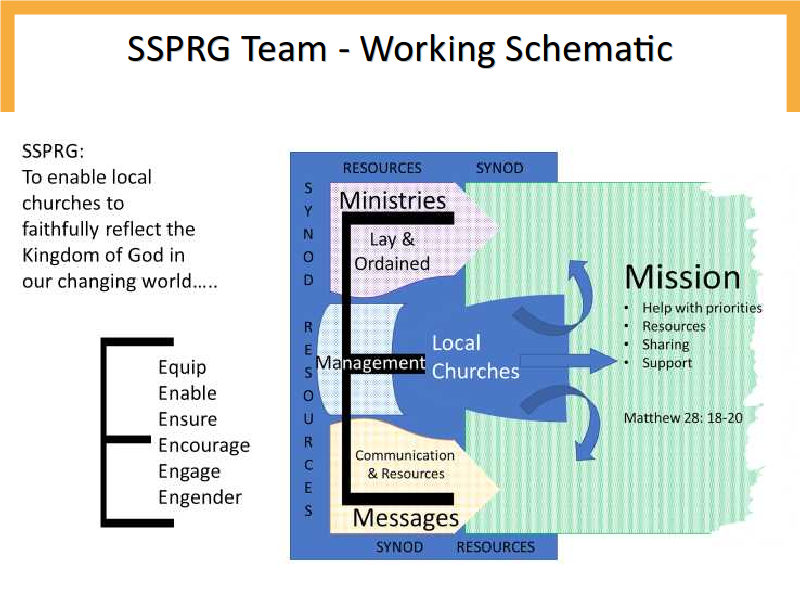 Some churches have received this positively - "it sounds exciting", "It is close to what we used to do in the past". Others with alarm - "How can a minister cope with six or more churches, it sounds like a recipe for rapid decline"
In order to show that it can work, Peter spoke to Revd Samuel Silungwe who trained and served initially in Kenya. His first pastorate was 60 churches. Admittedly he did have four non stipendiary ministers working along side him, but that was still 12 churches each. In his second pastorate he was the sole minister over 55 churches! They still thrived. So can we. After Peter's introduction there were several questions, presented here with the answers indented. Could the training officer be a lay post in future? This has always been a post open to lay or ordained. They synod appointing group has always chosen the best candidate. There is a big financial hit if we employ a lay person as they get paid much more that a minister. Is this not still simply spreading ministers thinner over the ground? Surely some churches are just going to have to go without. No, because we are working to redefine what a minister does and what is expected. It does mean a completely different style of ministry. Expecting churches to go without is not within the ethos of the URC. Why do we not have fixed term appointments, and expect ministers and pastorates to rotate? That is not possible within the URC structures, to which we are bound. The minister would be expected to attend elders but not church meetings. Church Meetings and church members are important too, are they not? If we expect ministers to attend church meetings as well then practically all their time would be spent in preparing for and attending (and often following up) meetings. There is much more for them to do than just that. What are the implications for the currently in post? At the moment Synod can not force a change on a current pastorate, but there will be some negotiating to be done between now and 2025. 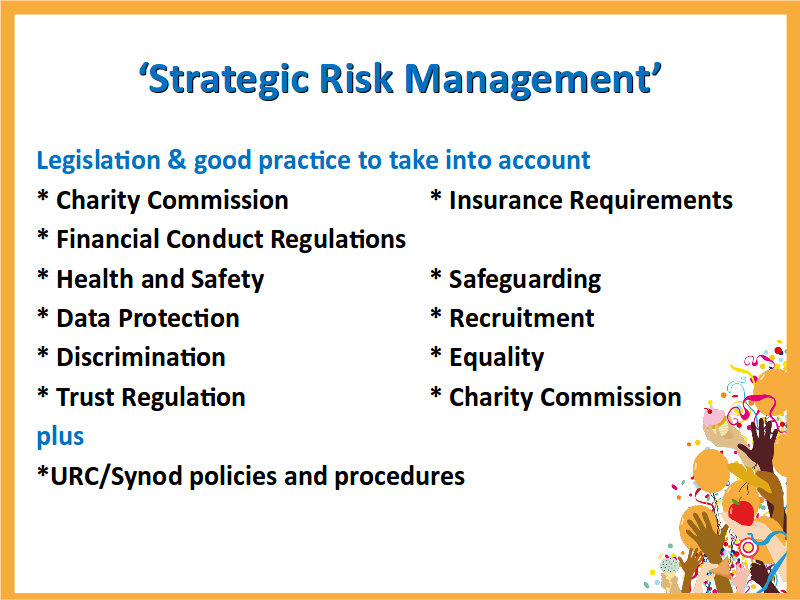 Peter reminded us that "A View from 2025" was a discussion document, and that a strategy for implementing it would be worked on should it be adopted by synod. There were four blue cards shown at the time for consensus. Their concern was that we should wait until after General Assembly 2018 when there is likely to be be proposed a change in the way ministers are called. The Moderator replied that even if it were agreed in 2018 it would have to wait until 2020 to be ratified, and perhaps longer to be implemented. We do not have the time, we must start now. If we adopt "A View from 2025" it would fit any changes assembly is likely to propose. The blue card showers indicate that they accepted that explanation, and the paper was adopted. 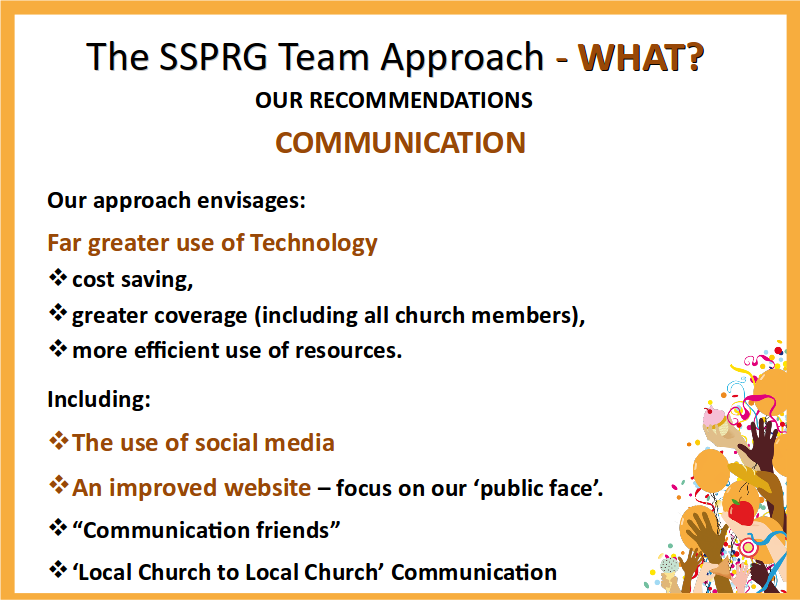 The Main regular business of the meeting - reports and a couple of resolutions from the Synod Task Groups - were presented with no 'speaking to the report'. This meant the the convenors had to get their information into their reports and clearly and as up to date as possible as they were only allowed to answer questions from the floor. It also meant that this business went through quite quickly. The Synod Clerk did however speak. She was keen to alert the churches to the fact that we need their help at General Assembly in July next year. It will be held at the Albert Hall, and as a Synod we have to provide volunteers to be stewards and general helpers. General Assembly is not a small event, and it will require 50 people to do it comfortably. Over lunch members of our host church, Sherwood, served home made Carrot and Coriander soup, or Tomato Soup with bread rolls, and tea, coffee and cordials. The Fairtraid stall did brisk business. We missed Sylvia Salmon who usually serves on the stall - she is not well. 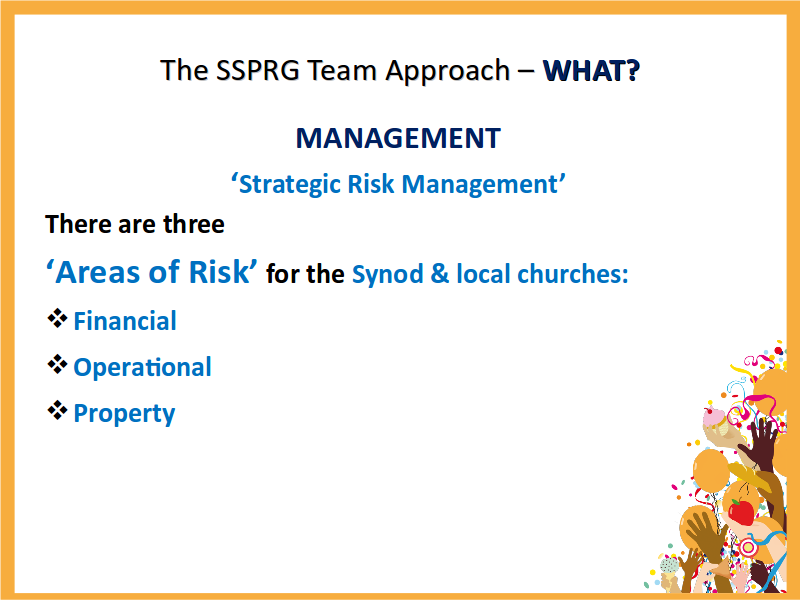 The first Presentation in the afternoon was an interim report by Geoff Shaw who is convenor of the wonderfully named SSPRG - The Synod Structures and Priorities Review Group. This group was set up because the Synod Review panel, set up in 2016 to consider the re-appointment of Revd. Peter Meek as Synod Moderator also recommended a serious review of the way the Synod worked. This was because of the particular challenges that result from the geography and number of congregations in this Synod. 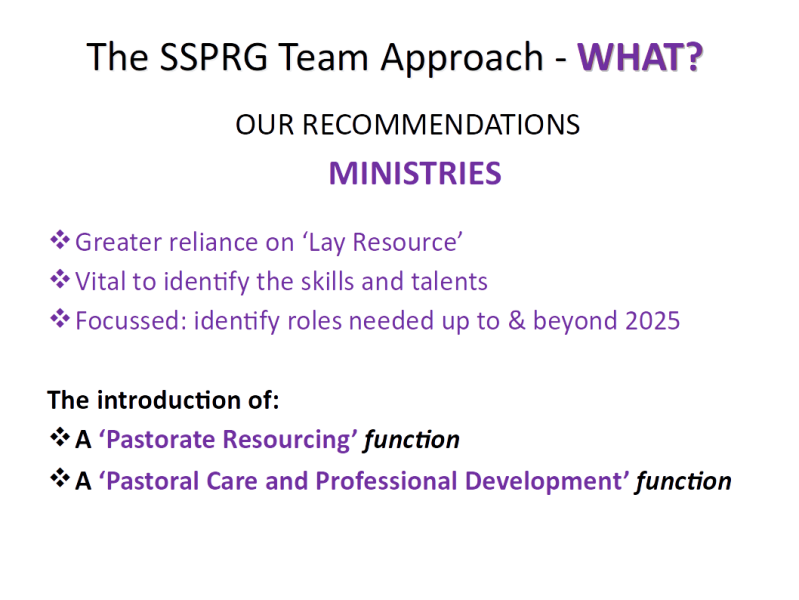 We were asked as a Synod to reduce complexity and ease the burden of meetings on both Ordained and Lay people. 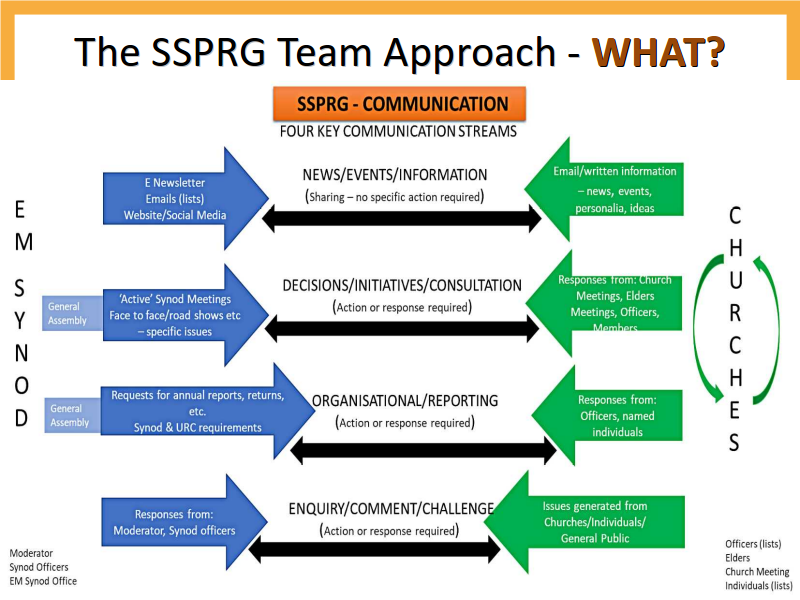 The SSPRG is looking at this. They are asking WHAT are the priorities for the Synod? HOW should these be organised? WHO should carry them out? To answer WHAT they started with a blank sheet. 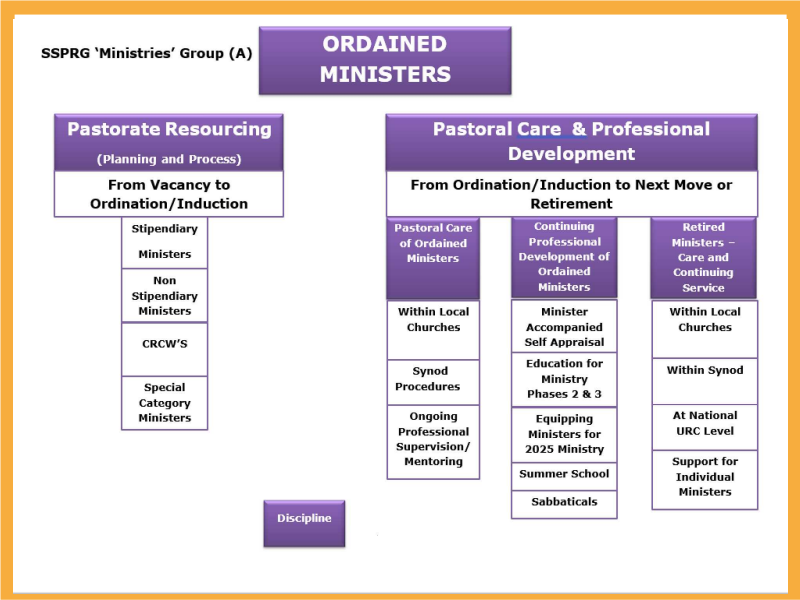 Rather than looking at the present structures and posts, they brainstormed and produced an steadily growing forest of Post-it notes, which they then sorted into seven categories: Ministries – Lay and Ordained, Communication, Management and Strategic Risk Management, Mission (Local Churches), Property and Finance, Children and Youth Work, Ecumenical. 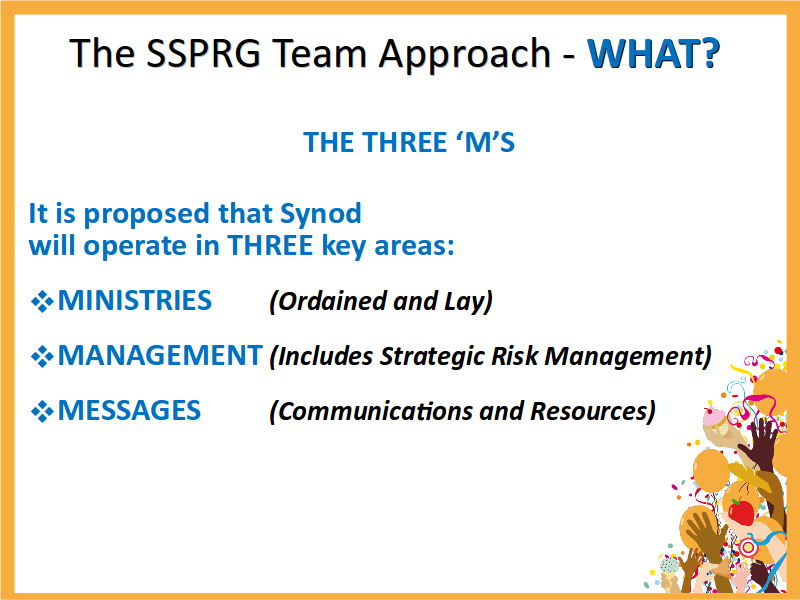 From this they realised that the Synod works in three key areas: Ministries (Ordained and Lay); Management (Includes Strategic Risk Management); and Messages (Communications and Resources). 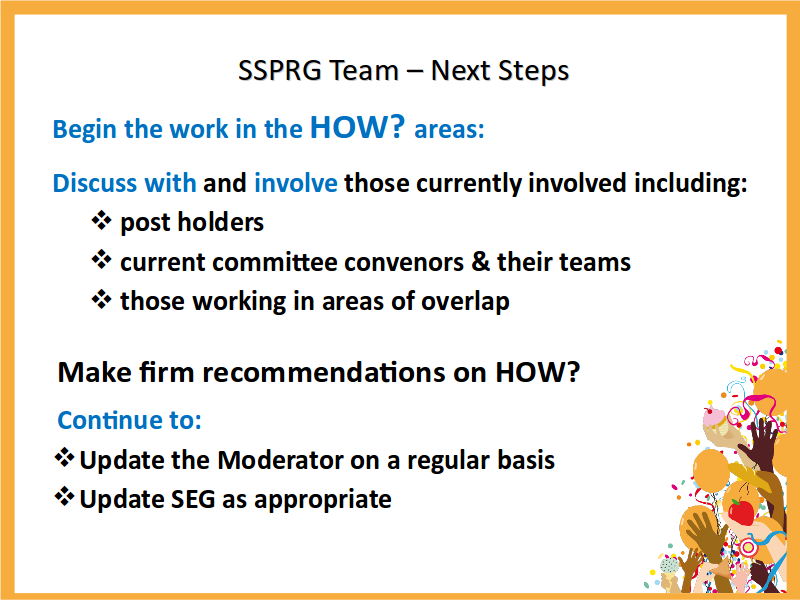 The SSPRG plans to make Final Recommendations to Synod in March 2018. The bulk of the afternoon was devoted to a blend of presentation from John Proctor, our denominational General Secretary, and the young people who had been beavering away in the Hall all morning. They had taken the offerings from people in the churches for a charter for the church - our own set of suggestions for 95 theses martin Luther style. These were sorted and collected together into 14 sections - which was 'co-incidentally' the same as the number of discussion groups set up in the church! The sections were Children and Youth; Community; Discipleship; Evangelism; Growth; Inclusivity; Local church; Love ; Modernisation; Peace; Spirituality; Unity; Welcome; Worldwide. Each group was handed one of these sections (with some sub points) and twenty minutes to come up with a 20 word statement. These we shared verbally and handed back to the young people who will collate a Charter for the Synod. This I expect will be posted on the website fairly soon. John Proctor rounded it off with a presentation. Here is Geoffrey Clarke's impression. A reminder of the gifts and grace embodied in our General Secretary, John Proctor. Edges matter to God : be there. Gradients don't scare God as much as they scare us. God is with us for the long haul - never promising it would be easy. At the end our CYDO Jane Henderson presented Geoff Shaw (on behalf of Newport Pagnell) a Child Friendly Church Certificate. Synod ended with an act of worship led by the Moderator.